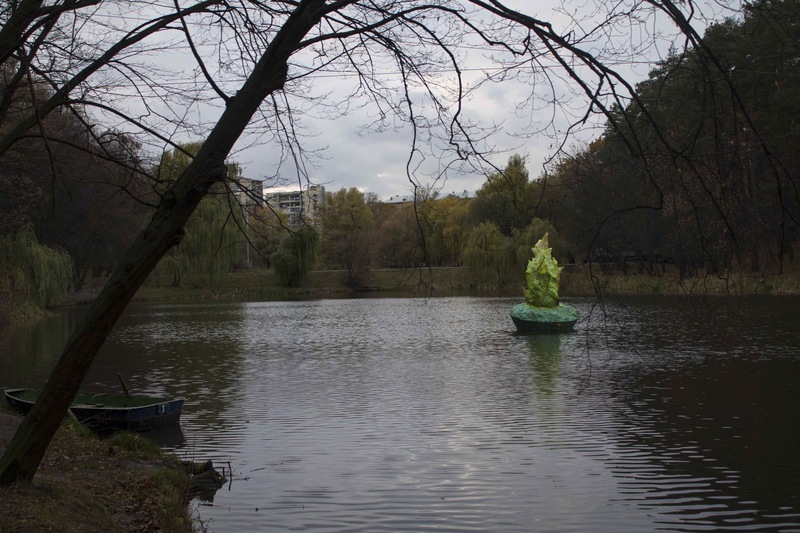 Ukrainian artist Anna Naduda created a luminous sculpture that has been installed on one of the lakes in the Rylskiy Park in Kyiv, Ukraine. 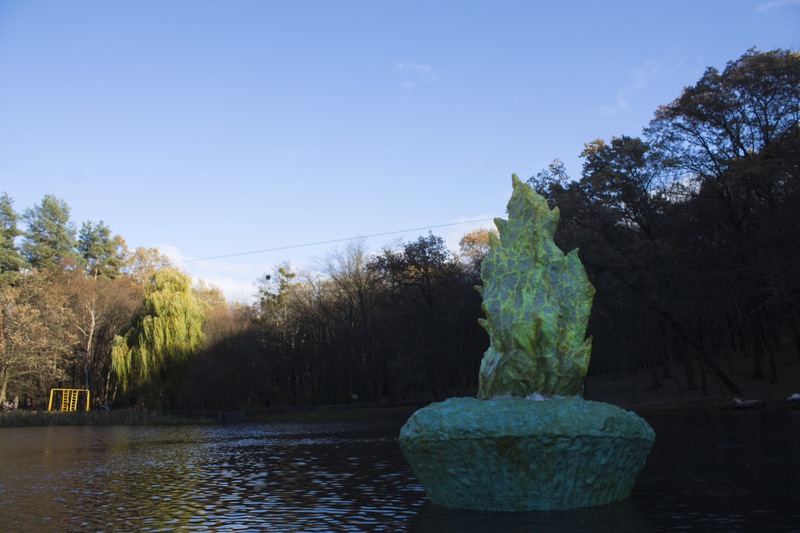 The sculpture called “Water Plant” is a continuation of her “New Bionics” series. It took more than four months to create the piece. 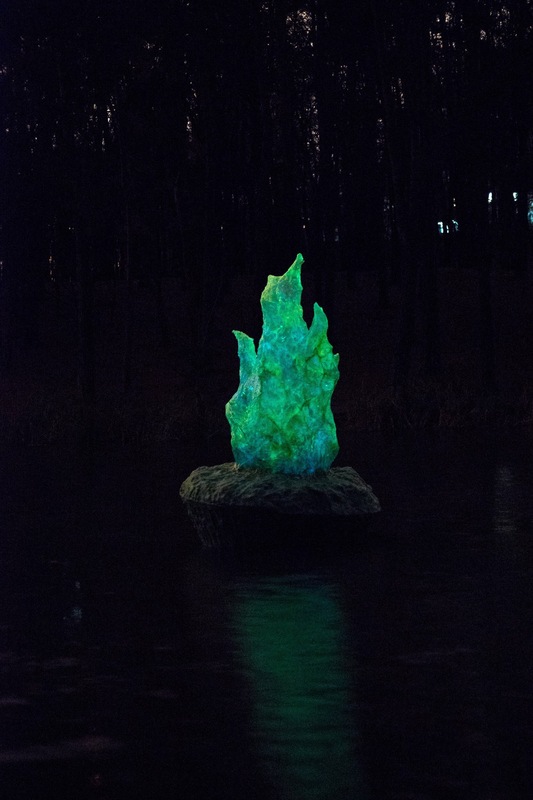 The artist used metal, resin glass and phosphors as basic materials for her sculpture. The overall weight of the piece is around 500 kilos. “I used a scrap metal for the carcass and I have built a floating-island from plastic bottles. I had a “pleasure” to visit a metal scrap-heap and fields of unprocessed plastic bottles. It was an impressive experience,” says Anna. “Water Plant” collects solar energy during the day and gives the light back during the night. The light is similar to the glow of plankton or moss. Anna Naduda deals with sculpture, interactive installation, graphics and performance. She cooperates with musicians, video artists, and participates in many exhibitions and projects in Ukraine, France, Britain, Poland and the United States. She lives and works in Kyiv. The installation was created as part of the Mural Social Club Festival that is organized by NGO Sky Art Foundation and Dmytro Palienko, curated by Julia Ostrovska and Oleg Sosnov. All photos are by Maksim Belousov and Anna Naduda. Kalkov’s new piece is an artwork of the series called “The Cycle”. The main core of the series is a spiral pattern that is encrypted in “8-bit” and “op-art” languages. The artist says that his mural is a symbol of knowledge, development and cyclical process of the Universe. Andriy Kalkov was born in Lutsk, where he lives and works now. In 2012 he earned a degree in monumental painting of Lviv National Academy of Arts. Kalkov took part in many urban festivals and more than 30 collective exhibitions all over the world. “Unlike my recent work, I haven’t used transparency effect of the primary colors for this piece, only a slight presence in gray. My search is developed on the behavior of pure colors and overlapping. The white background is almost non-existent, the wall is saturated with figures that respond to a central point. None basic geometric element is present, but the hardness of the transverse lines give a sense of geometry. This piece establishes the debate about the importance of empty spaces (air) in a composition”, explains Elian. Grebenyuk had started his artistic career as a street artist in 2004. He participated many street art festivals in Ukraine and abroad. In 2011 he initiated a creation of artistic group called “Good People” in the city of Donetsk. The group managed to create five murals in Donetsk before the war started. Since May 2014 he lives and works in Kharkiv. 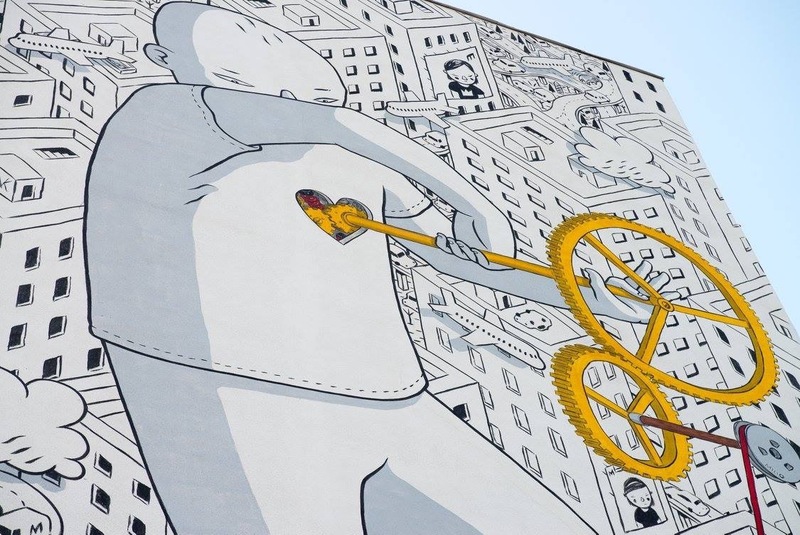 World-known Italian artist Agostino Iacurci just finished his large-scale mural in Kyiv, Ukraine as a part of the Mural Social Club Festival. The title of the artwork is ‘Water, please”. The mural is a part of Iacurci’s series of new interventions depicting “Still lives”. The painting represents a classical subject of still life with an indoor plant transposed on an exterior public wall in an oversized scale. 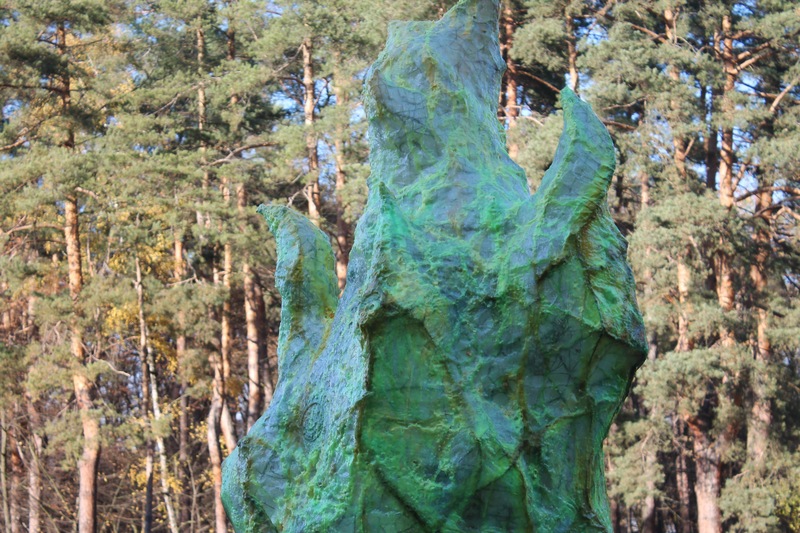 “The work has been inspired by the reading of the blog “Another Ukraine”, which describes unexpected and non-stereotyped elements of culture and nature of Ukraine, for example its flora, that features a wide variety of plants coming from all over the world and able to adapt to different parts of its territory”, Agostino explains. Greek street artist Fikos created the biggest Byzantine painting in the world. 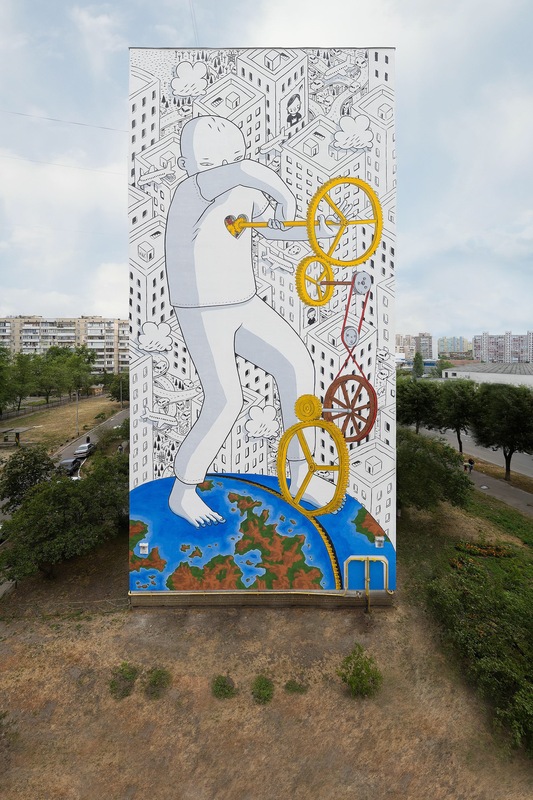 As a part of the Mural Social Club Festival that is taking place in Ukraine a renowned Greek artist Fikos Antonios decorated a 16-floor high building in Kyiv with the world’s biggest Byzantine painting. The name of the artwork is “Earth and Sky”. “People you see are the personifications of the earth and the sky. The piece became the biggest artwork in history of the Greek art since ancient times. It is definitely the biggest Byzantine mural ever, it is three times higher than the chryselephantine statue of Zeus in Olympia, one of the seven wonders of the ancient world”, says Fikos.